The project concerned the digitization, cataloging and subject indexing of at least 40,492 digital objects with at least 346,000 pages. Simultaneously with the digitization, the documentation of digital objects took place in international metadata standards (Dublin Core qualified, or MODS). 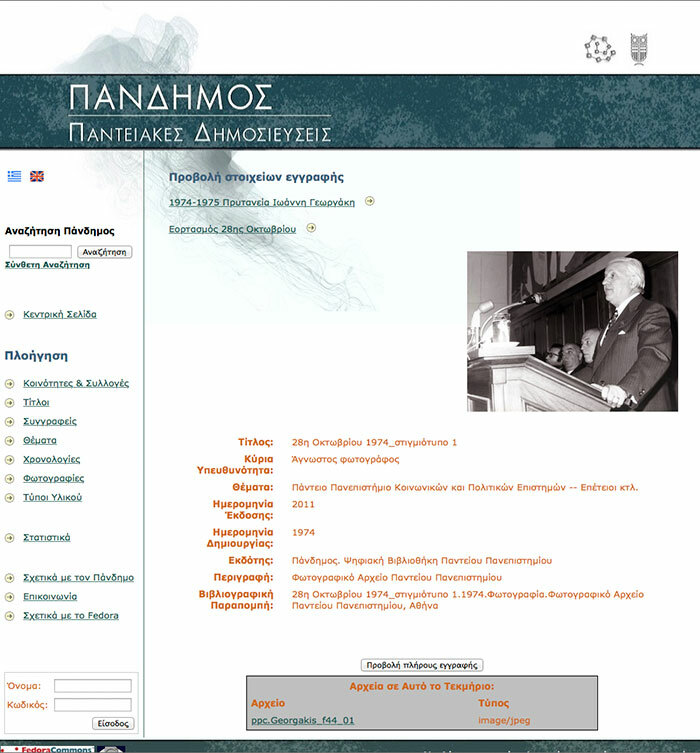 The Panteion University Library and Information Service had obtain authorization for a series of periodic Greek publications by the holders of copyrights to digitize and distribute them for free via the University's repository "Pandemos". These new digital collections were hosted on "Pandemos" using internationally recognized services standards (eg JSTOR), adopting the “moving wall” method. Furthermore, the project included the cataloging and subject indexing either of magazines of historical importance for the social sciences that had already been digitized or the Library owned their digital copy, or digitized from scratch, e.g. the “Anti” magazine. Overall as counted, 249,063 pages of textual format were scanned and 346,608 pages underwent the OCR process (96,545 pages had already been scanned). The University’s photographic archive collection concerned material that was placed from the 1950s until today. Those photos covered thematic events that were held: anniversaries, proclaimed honorary PhDs, building openings, as well as officials’ visits to the University. In other words, the photo collection consisted mainly of historical photographs, thus complementing the historical archive of the institution. With the inclusion of this material in "Pandemos" we achieved the preservation, the publication and the promotion of the University’s history, as well as its disposal for academic and historical research. Part of this archive was digitized and formed the basis of the collection in the first chronological level, i.e. per deanery, and in the second level, i.e. themed, per event. It was estimated that the completion of the collection made it necessary to digitize approximately 1000 more photos, which were in various photo albums under the responsibility of the Public Relations Department. Those photos needed a sum of technical requirements concerning the quality of service. Realiscape Typorama used photographers who were highly specialized in digital editing of photo archives.